One of the definite highlights of my trip to Colombia was hiking through Parque Nacional Natural Tayrona. 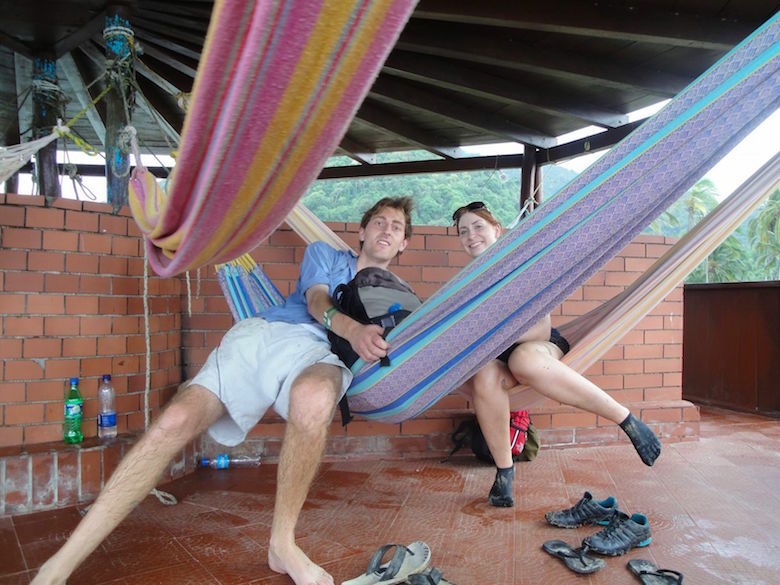 If you’re traveling to Colombia, it’s one of the top things to do. 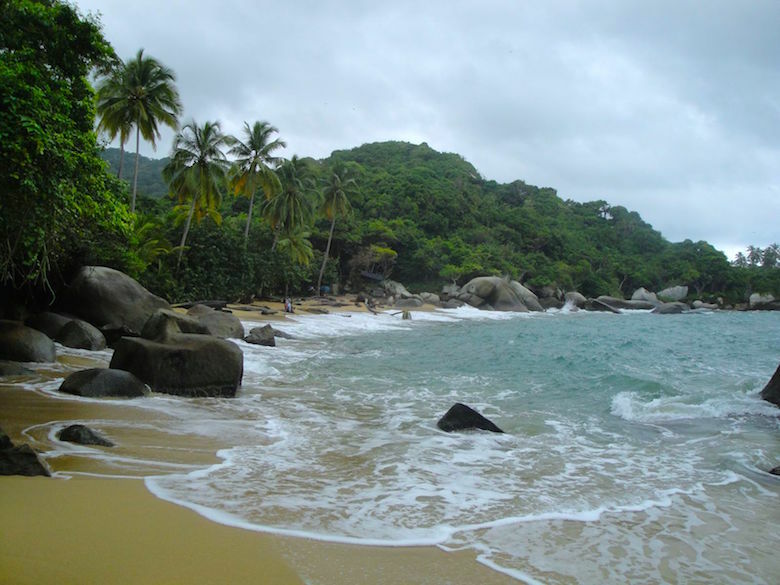 Parque Tayrona is Colombia’s national park which lies on the Caribbeancoast at the foot of Sierra Nevada of Santa Marta. The Park covers 12,000 hectares of land and 3,000 hectares of sea. In Taganga we hired a driver who brought us to the park’s entrance. There you buy a ticket to enter the park. We’d made sure to prepare enough food, since you can’t find any shops or restaurants in the park; it won’t be until the end of your long hike that you encounter some – so come prepared and take enough water with you. 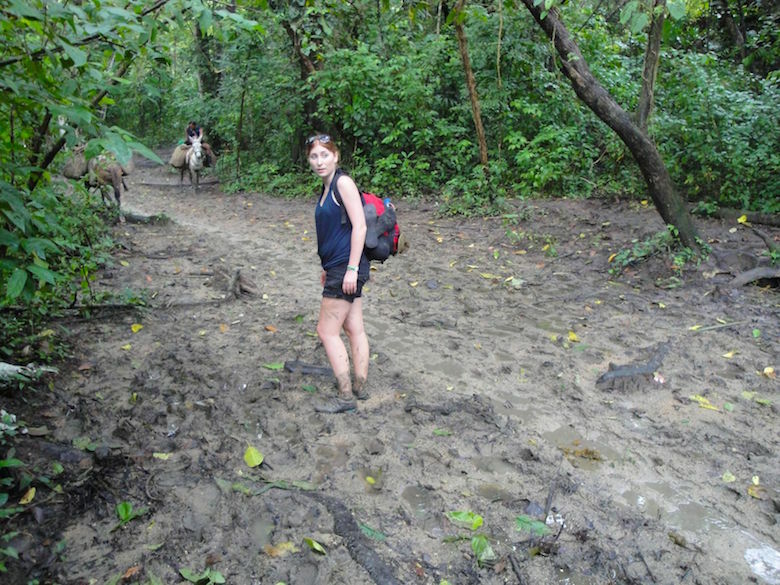 The hike follows a path through the jungle and since it’d been raining a lot before we came, the path was quite muddy and we had to take off our shoes at times. It was quite fun to get stuck in the mud and struggle to get out of it. The mud slowed us down a lot, but in the end, after a few hours and crossing a river, we reached the sea and a long sandy beach came into view. This feeling of being in the middle of nowhere surrounded by the jungle was really worth it. We followed the way along the coast and somehow got lost. Luckily, we found our way back to the jungle and some huts and people. We eventually reached our final destination Cabo San Juan, an idyllic hut with hammocks located on a huge rock in the water. We could either sleep in the hammocks in the hut or in a tent, but since we had an amazing view from the hut we opted for the two hammocks, which turned out to be quite comfortable. In the evening, we met some other tourists with whom we played a card game called “Shithole”. Going back to the hut in the evening was more difficult than expected because there was no light at all and we had to cross the water, but with our headlights we managed to get back. The next day we relaxed on the beach and walked along another muddy path with some British tourists to experience a breathtaking view on Cabo San Juan from the top of the rock. In the morning, we sadly realized that we hadn’t brought enough money so we had to skip lunch and eat coconut. We made up for it later, since dinner was pretty filling. The next day we left just after lunch, but this time we walked along a different path that was even more muddy and the vegetation more dense. Since I was barefoot the whole time, I hurt myself several times. I was relieved when we reached the entrance after a few hours and managed to catch in time the car which brought us back to our hotel in Taganga. 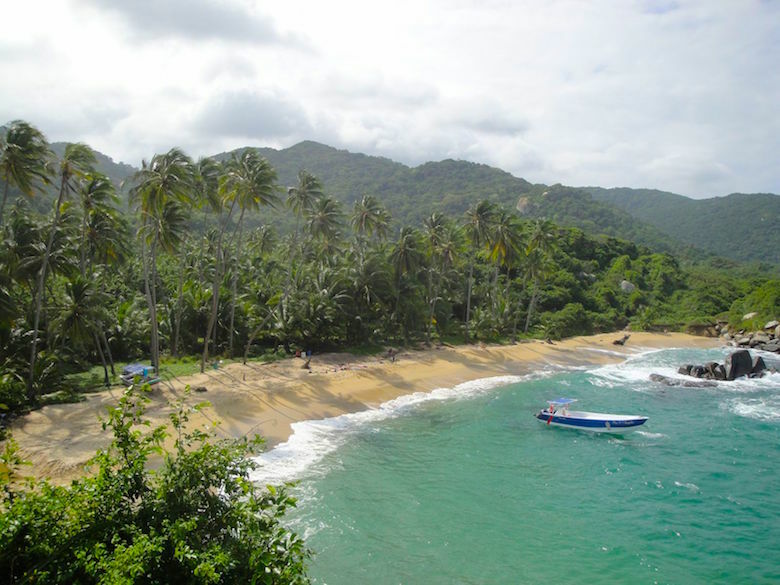 If you are visiting the Northern part of Colombia, you definitely need to visit the Tayrona National Natural Park – it’s an ultimate highlight. There are many great paths and destinations in the park. 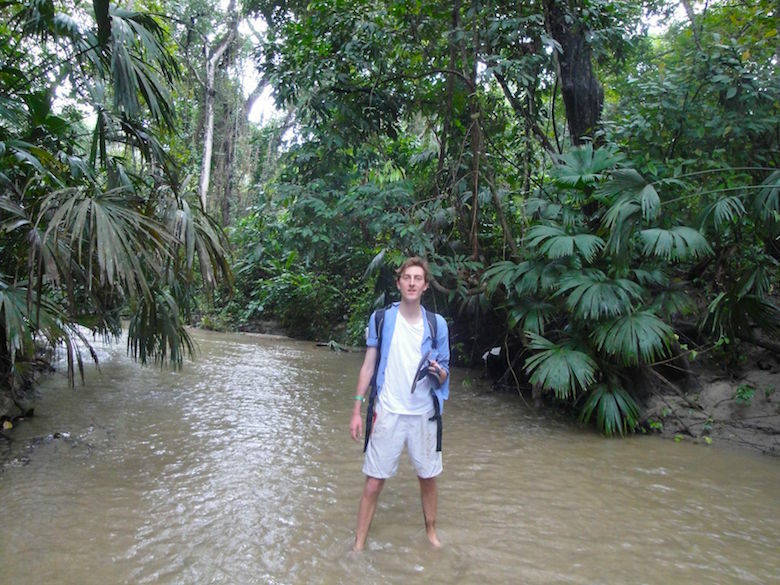 You can also go on longer treks that will take you even deeper into the jungle. 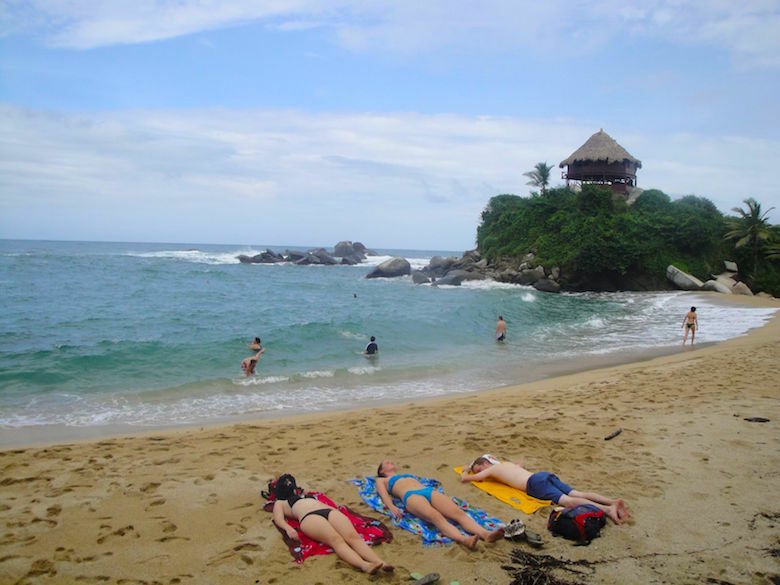 It’s up to you, but even two nights are totally enough to experience the beauty of Parque Tayrona.